The average salary for a dentist in Virginia is around $149,090 per year. This is 158% above the national average. ● Updated in 2016. Dentists earn an average yearly salary of $149,090. Wages typically start from $76,350. How much does a dentist make in Virginia? How much does a Dentist earn? Most dentists, approximately 80 percent, are general dentists, according to the American Dental Education Association. The rest specialize in fields, such as pediatric dentistry, orthodontics and surgery, which require additional years of study and typically result in higher salaries. With an average salary of $166,810 in 2014, dentists earn far more than most other health-care workers. Dentists earn much more than dental assistants ($36,260) and dental hygienists ($71,970). Registered nurses ($69,790) and pharmacists ($118,470) also make less than the average dentist. Just like other professionals, dentists make less than their counterparts in the beginning of their career. In the year 2008 the lowest 10 percent of the general dentists earned an hourly wage of $34.55 per hour or $71,870 per year. However, the earning capacity of dentists keeps on increasing with their experience. For example, the top 10 percent of general dentists still earn about $100,000 per year whereas the top earners in this field can accrue up to $190,000 per year. 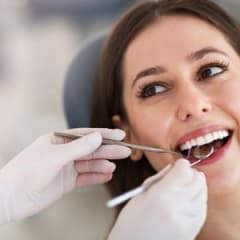 How do dentist salaries compare to similar careers? Dentists earn 8% more than similar careers in Virginia. On average, they make less than pathologists but more than chiropractors.